JNI Pallet Systems has responded to the ever growing need from the market to deliver a cage to safely and securely store fork lift cylinders. They are very pleased to announce the design of this new product, the Fork Gas Cylinder Cage to their ever expanding range. 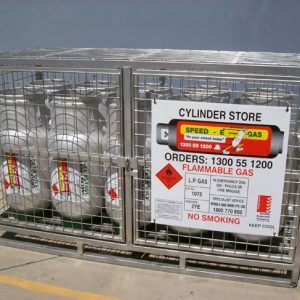 The Fork Gas Cylinder Cage comes standard in two sizes and gives the ability to store either 6 or 10 individual 15/18kg cylinders. A robust yet economical cage, it is manufactured from high strength, welded construction, pre galvanized RHS and clad with 75x50x4.0mm galvanized mesh giving ample ventilation. A galvanized sheet lid can also be added for outside storage. The base configuration allows for easy transportation by forklift with the frame having the safety of an anti tip base in case of uneven or unlevel ground. Security is a breeze as they are also lockable.